Standard physics resembles a patchwork quilt. Prior to the discovery of his first thruster invention described elsewhere https://igg.me/at/levitation-thruster and http://etheric.com/nassikas-thruster-light-years-ahead-of-the-dawn-spacecraft-ion-propulsion-system/, Dr. Athanassios Nassikas had been for many years developing a philosophical methodology based on the principles of logic that would allow one to judge the desirability of physics theories. Namely, this approach led him to the conclusion that physics theories concocted with the minimum number of independent axioms or hypotheses would be the most desirable because they would result in the minimum number of internal contradictions between their set of axioms. Having a minimum number of contradictions is obviously a desirable objective for a valid physics paradigm. He calls his approach “minimum contradictions physics”. I totally agree with his approach. I have stated that physics has become way to complex and that it has a lot of rubbish that needs to be thrown out; see the following posting: http://etheric.com/some-rubbish-in-physics/. Also in previous lectures I had argued that modern physics consists of a combination of many separate theories such as quantum mechanics, quantum electrodynamics, general relativity, special relativity, etc. and that each of these sub theories has not much in common with the other, nor is one derivable from the other. 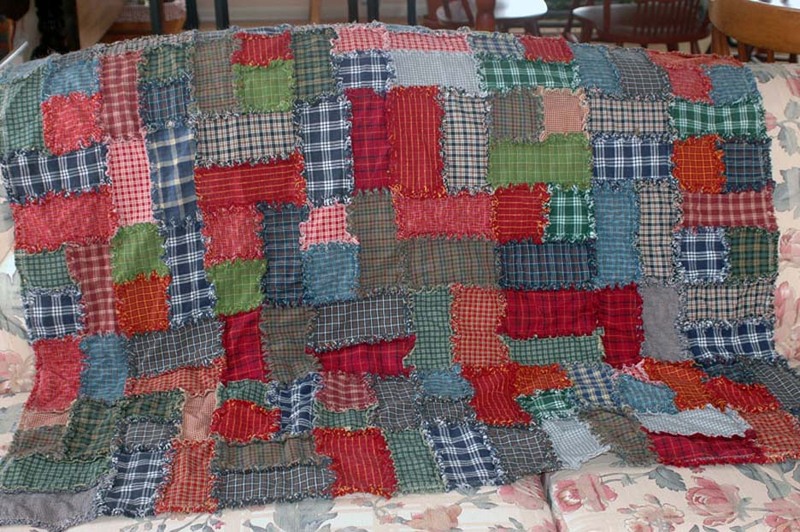 Mathematicians have attempted to sew these bits together using what they call unified field theories, but the end result is a patchwork quilt, similar to that shown above. The logic approach developed in minimum contradictions physics leads to the conclusion that this is an undesirable circumstance. The minimum contradictions approach that Dr. Nassikas developed helped to inspire the discovery of his first thruster invention and offers a useful theoretical background for understanding why it is able to function while seeming to break two laws of physics, the conservation of momentum and energy. Here we will give in his own words the approach he developed and later we will show how his approach compares to the subquantum kinetics methodology. “The purpose of this posting is to discuss the theoretical background to the thruster inventions that was formulated prior to their development. Namely, the minimum contradictions physics theoretical grounding I had developed led me to the conclusion that quantum space-time is itself matter. This in turn led me to believe that the energy conservation principle is properly construed by taking into account the material nature of the quantum space-time that surrounds us, and this facilitated me to understand the nature of the operation of my inventions which have unexpected results from the standpoint of standard physics. Let me tell a bit about my approach which is basically concerned with achieving simplicity and elegance in physical theory, something that most physicists would agree is a worthy objective. Let us begin by considering what is correct on the basis of Aristotelian Logic (AL). AL, which consists of Classical Logic and the Sufficient Reason Principle, forms the basis of all our logical communications as human beings. It is inevitably valid beyond any further axioms that we happen to propose, such as those of the QM and the GTR. Consider for example, the anterior-posterior (AP) axiom that we automatically use when we speak or write in anterior-posterior terms, e.g., in sequencing events as 1st, 2nd, 3rd, etc. Alternatively, we find this in language where the letters forming a word have an anterior-posterior relation to one another, or where the words forming a phrase, as in subject-verb-object, have an anterior-posterior relation to one another. This AP axiom is not a theorem of AL. QM also is not a theorem of AL. GTR also is not a theorem of AL. Other axioms are also not theorems of AL because otherwise they would necessarily constitute a tautology with AL. Because of the aforementioned theorem, the introduction of each of these axioms into our conceptual framework or paradigm leads to the creation of additional contradictions in the overall paradigm. Since contradictions are inescapable, it is desirable to devise a theory whose axioms engender a minimum number of mutual contradictions. Now, we can have such a minimum number of contradictions when we state a theory founded only on the AP axiom whose use is inevitable and necessary if we are to communicate with one another. For example, try stating something out of the anterior-posterior process and you will find very quickly that it is very difficult not to include use of this axiom. Thus, the most mentally consistent attitude is to state a theory in anterior-posterior terms, hence one having extension in both spatial and temporal terms. Since a theory based only on the AP axiom has extension in space-time and is also inherently contradictory, it follows that this space-time should be of a stochastic-quantum nature. Furthermore due to the fact that this theory should express everything, this quantum space-time should be matter itself. On this basis we reach the notion of “quantum space-time” which is the “substance” within which all things exist and from which all things are made. On this basis also, by the aid of the Fourier analysis, we can reach the Schrödinger relativistic equation; i.e., the space-time quantum mechanics which all physicists are familiar with, where the psi function expresses any complex space-time relative magnitude and which holds physical significance through the aid of the probability density function [1,2,3]. Note that classical QM deals with particles, while the space-time quantum mechanics proposed here deals with quantum space-time itself. This proposes that there is (g)-mass space-time and (em)-charge space-time which interact-communicate with one another through the exchange of photons [(g) or (em) particles, quantum space-time formations with zero rest mass] . This view of space-time contrasts with what the general theory of relativity (GRT) teaches. The GTR assumes that a quantum vacuum exists, but that it is not present everywhere, i.e. that it is present only in certain privileged areas. Namely, it holds that there is a clear distinction between matter and space-time and that matter does not exist everywhere. However in quantum mechanics (QM) we find a different outlook. QM teaches that there are an infinite number of probability densities whose integral is equal to 1, this being by proof, not by assumption, and this in turn implies that matter should exist everywhere. Hence there is a fundamental contradiction between GTR and QM that is an undesirable feature of standard physics. This is avoided in the minimum contradictions physics approach that I have developed. This theoretical approach together with my studies of electrostatic asymmetrical reactionless thrusters, such as those developed by T. Townsend Brown and Alexander Frolov, led me to develop a magnetic asymmetrical reactionless thruster configured as a nozzle shaped superconductor. The Nassikas Superconducting Thruster. A conical high-temperature YBCO superconductor (1) and a 0.5 T permanent magnet (3). In the U.S. patent for Thruster I , (US 8,952,773 B2), one may notice that by use of magnetostatics equation [Eq. (1)] one reaches the conclusion [Eq. (6)] that a net propulsive force should exist on a nozzle shaped superconductor casting, on the condition that this superconductor acts as a magnetic field shield, which is in fact the case. The resultant force acting on this conical superconductor casting (1) is found to propel the superconductor towards its direction of convergence. We reach a similar result when we apply finite element analysis to a conical superconductor-magnet combination. Such analysis may be performed by computer programs such as Quick Field which are widely used in the electrical industry field. So classical magnetostatics and computer analysis techniques used widely in industry both predict that our thruster should develop a propulsive axial force. In the case of Thruster II, we reach the conclusion for the existence of a propulsive force by taking into account that the magnetic field created by the coil passes through the surface of the REBCO tape to interact with the current flowing within the tape and thereby generate Lorentz forces. Vector analysis shows the existence of an unbalanced force component acting on the coil. By taking into account the existence of superconductor magnetic field shielding effects, one is led to more complicated models of this interaction which are used by companies specialized in the manufacture of REBCO CC magnet coils. So such calculations are preferably carried out using such in house programs. 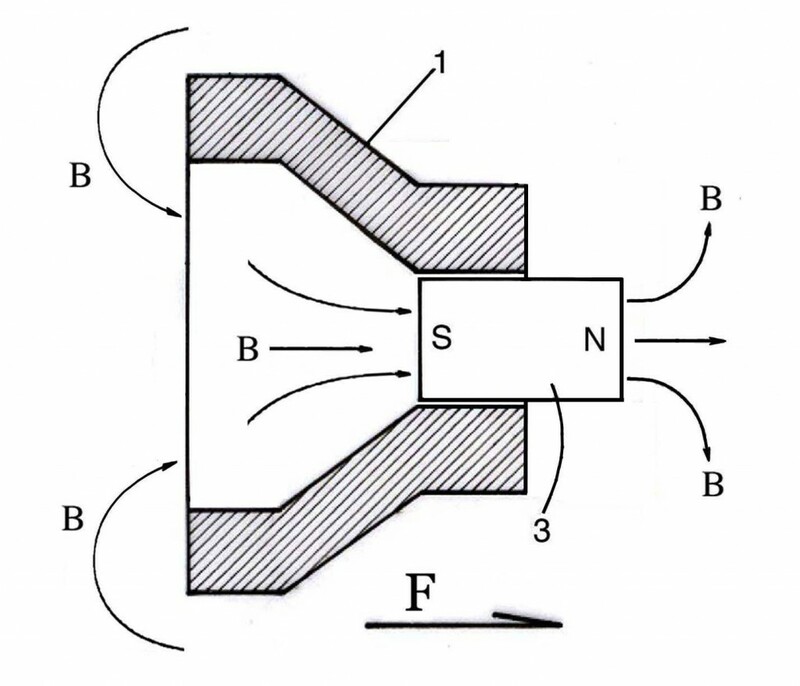 It is noted that thruster I and thruster II have strong similarities; thruster I ( which has been experimentally tested) operates as a superconducting nozzle where the magnetic field is created by means of a permanent magnet, while thruster II operates as a superconducting nozzle where the magnetic field is created by means of the superconducting nozzle itself, the REBCO tape being both a superconductor and a current carrier at the same time. Thus, in both of these cases the application of classical physics mathematical models to superconductors leads to the prediction that a propulsive force should exist, a result that is in contrast to the conservation principles of classical physics itself. From this we may conclude that superconductors cannot be described by classical physics. However, we believe that the aforementioned space-time quantum mechanics is able to resolve this contradiction by proposing that the surrounding quantum space-time behaves as matter itself and thereby plays an active role in the conservation principles applicable to the kinetic behavior of the superconductor. For more information on the minimum contradictions physics paradigm, please read the references cited below. 1. Nassikas, A. A, Miminum Contradictions Everything. Reviewed by Duffy, M.C., Ed. Whitney, C.K., Hadronic Press, pp. 185, ISBN: 1-57485-061-X, 2008. Amazon. 2. Nassikas, A.A., Theorem Proving the Existence of Contradiction, Minimum Contradictions, Fuzzy Thinking and Physics in Logical Communication Scientific Journal of Mathematics Research 2013 Vol.3 No.6 2013-12-25. 3. Nassikas, A. A. Minimum Contradictions Physics and Propulsion via Superconducting Magnetic Field Trapping. AIP Conf. Proc. 1208, pp.339-349, SPESIF 2010. Abstract published at SAO/NASA. 4. Nassikas, A. A. Superconducting self propulsion requires beyond the standard model AIP Conf. Proc. 1479, 1024 (2012); http://dx.doi.org/10.1063/1.4756319. 5. Nassikas, A. A. U.S. Patent No. US 8,952,773 B2, 2015. Subquantum kinetics qualifies as a minimum contradictions physics for the reason that it posits a minimum number of axioms. It embodies the rules of logic and as well the anterior-posterior axiom. Use of the latter is evident in the statement of the Model G reaction-diffusion system which specifies the transmutation or reaction of certain etheron reactants into etheron products, i.e., A —> G, the reactant on the left (A) being anterior and the product on the right (G) being posterior. So the anterior-posterior axiom is incorporated into subquantum kinetics at a very basic level, the equations the define the transmuting ether, this having both spatial characteristics as well as temporal characteristics. The assumptions that form the structure of subquantum kinetics mainly deal with describing the functioning of this basic reaction-diffusion system and may be found set forth in Chapter 1 of my book Subquantum Kinetics. It is not surprising then that the quantum space-time concept that Dr. Nassikas has arrived at through his minimum contradictions physics is essentially the same as the ether concept presented in subquantum kinetics (SQK). Note that above he states “quantum space-time is the ‘substance’ within which all things exist and from which all things are made.” This ‘substance’ is isomorphic with the concept of ether that is described in subquantum kinetics. Like SQK, Nassikas’ theory also embodies an electrogravitic field connection His theory proposes that (g)-mass space-time [associated with gravity] and (em)-charge space-time [associated with electric charge and magnetic field intensity] interact-communicate with one another through the exchange of photons conceived of as massless (g) or (em) particles. His photon exchange concept bears a resemblance to the etheron reaction process where G-ons transform to produce X-ons and also where X-ons transform to produce G-ons through a reverse reaction. Nassikas’ theory envisions that quantum space-time embodies an unmanifest reservoir of energy. Similarly, in SQK, the omnipresent transmuting ether serves as the vast Prime Mover of our physical universe that sustains all physical form and is ultimately the source of all energy that manifests in our universe. 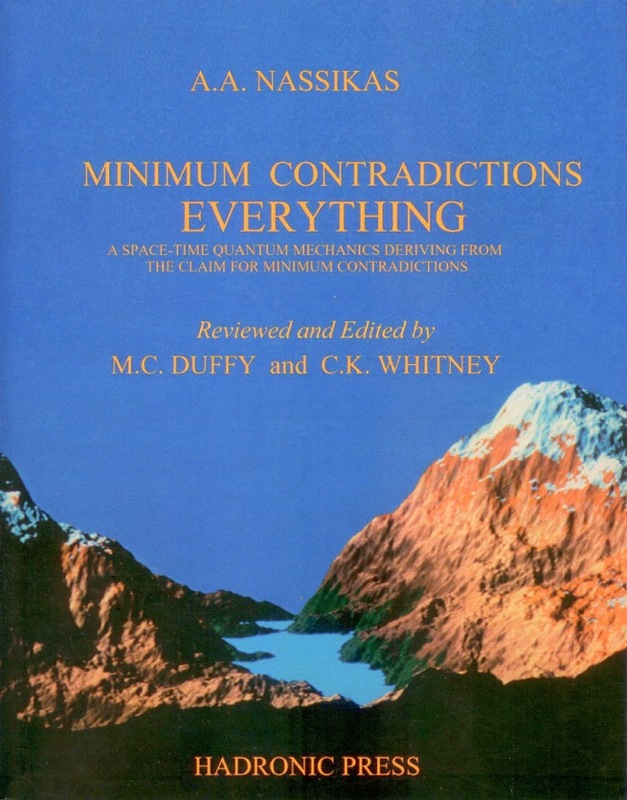 The minimum contradictions physics approach is what may be categorized as metalevel science, i.e., the use of science to look at science itself. A very good discourse on this is provided by Justin Coven in his set of videos on Metalevel science. In his fourth video Coven compares SQK to general relativity theory. At minute 25:20 in the video he compares different models according to their complexity. He states that the number of particles sub-models, elements, equations, dimensions, and levels should be minimal or minimized. Thus here he states the benefits of an approach similar to that of Dr. Nassikas’ minimum contradictions physics. He points out that the unified field theory actually comes out on the minus side as very complex and cumbersome. He says that it is better not to have fields as independent sub models at all, since the introduction of each field adds a level of complexity. Nassikas would add that the introduction of each field also introduces additional contradictions into the theory as a whole. Coven contrasts this case with that of SQK in which the various fields emerge as corollaries of the initially postulated foundation model, and points out that this is a benefit of that theory since it leads to simplicity of the theory as a whole. He states that SQK is comprised of a total of just 18 components (etheron types, interactions, time and space dimensions, and linear momentum) whereas standard physics theory is comprised of hundreds of components. Awesome posting, Dr. LaViolette. I’ll not presume an axiom, but smile with the old adage to “keep it simple” being a classical ideal for good reason. Ex: Beethoven’s epic symphonies gestated into architectural grandeur from simple cell-motives which underwent thematic development in the mind of Genius, to our great transcendental benefit experiencing a higher realm of consciousness (ETA Hoffmann). I’m trying to express the marvel in this coalescing unity of yours and Dr. Nassikas’ evidenced cosmic comprehension.